We are known as Virginia’s Top Rated Local® tree care experts. That’s not some self-given title, either, as we have some reviews we’d like to share with our readers and prospective customers today. In today’s world, it seems like there are five negative reviews for every positive one. This stands to reason because most people simply move on with their lives upon receiving a service that they’ve paid their hard-earned money for. It’s when things don’t go according to expectations when it becomes an issue and people are more likely to attempt to make note of the problem in a public way. 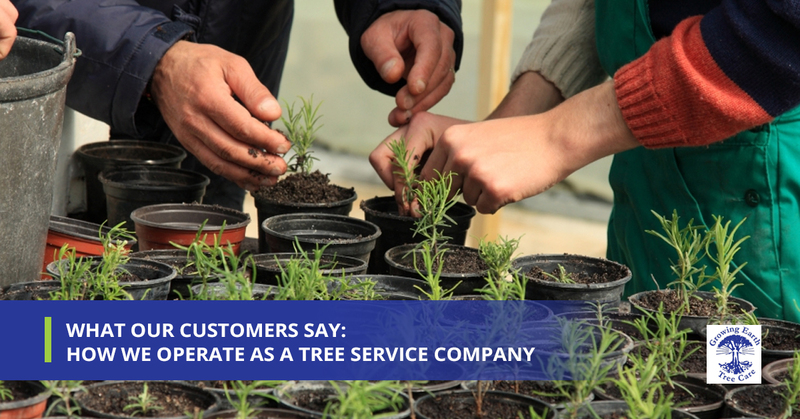 That’s why we are so proud to share some of the testimonials and experiences our customers have written about working with Growing Earth Tree Care. We are Northern Virginia, Fairfax County, Ashburn, and Vienna’s top choice for tree maintenance and tree care. These reviews are our lifeblood because it’s a message from current customers to prospective customers. Keep reading if you want to learn more about our Ashburn tree company called Growing Earth Tree Care! Veni, thanks for taking the time to let us know how your experience with us went. We are always pleased to hear that our certified arborists are helpful and able to provide you with some advice in addition to giving outstanding tree maintenance! Whoever you are, thank you for your kind words! One aspect of this review we would like to highlight is the fact that we make a point to operate with respect when we are on your property. From free estimate until the job site is picked up and looking the way we found it, we understand that we are guests on your property and our certified arborists will behave as such. When you hear words like professionalism and honesty as describers of how your business is seen by your customers, you can’t help but have a grin on your face that stretches from ear to ear. We are happy to help you out, John, so thank you for returning the favor by letting others know what kind of tree service we provide at Growing Earth Tree Care! And, of course, thank you for your business. Whether you are looking for tree stump removal services, general tree maintenance, or you have a more specific problem, give your local tree care company a call and we can come out to your site to provide you with a free estimate!